Melatonin can function as a hormone that helps you sleep, but can it also help with exercise performance and body composition? Here are this supplement's uses, forms, dosage, and side effects. Melatonin is most known for its role in helping you fall, and stay, asleep. However, melatonin receptors are found throughout your body. For example, high melatonin levels are found in the gut, not just in the pineal gland that regulates sleep. So it shouldn't come as a surprise that supplementing with melatonin can provide more benefits than just helping with sleep problems. In humans, melatonin is derived from the essential amino acid tryptophan (the amino acid associated with drowsiness after Thanksgiving dinner). Through a series of reactions, tryptophan is converted to serotonin, which is then used to make melatonin. Melatonin production was once thought only to happen exclusively in the pineal gland in the brain, but other tissues, like your gastrointestinal tract and skin, also make melatonin. Your gut, for example, has been shown to hold 400 times more melatonin than the pineal gland. 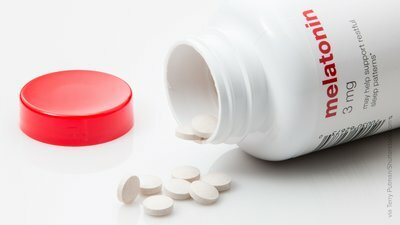 A likely explanation is that your pineal gland makes melatonin to effect circadian rhythm-controlled functions throughout your body, while melatonin production also occurs in other tissues based upon the conditions of their own unique environment. Melatonin's best-known job is to help you sleep and to modify your circadian rhythm—the physiological, mental, and behavioral events that follow a daily cycle (e.g., times of day that you regularly feel the need to eat and sleep). This makes it a good hormone for people with sleep disorders to know about. Melatonin has been shown to act as a hormone, cytokine (cell signal), and biological and nervous system modulator. It affects almost all of the body's systems, including nervous, endocrine, immune, digestive, circulatory, musculoskeletal, reproductive, and integumentary (e.g., hair and skin). What are the bodybuilding and fitness benefits of melatonin? From an athletic standpoint, melatonin's role as a sleep aid and antioxidant may speed exercise recovery and help you rack up greater training volume for better long-term gains. Likewise, melatonin's effects within the gut may make it a key player in fat loss. Here's a better look at the potential benefits of taking melatonin as a dietary supplement. Melatonin supplements can shorten the time it takes you to fall asleep. This sleep-inducing effect can help night owls shift their sleeping pattern so that they get to bed earlier and start the following day earlier. Being an extreme night owl is a symptom of a sleep disorder called delayed sleep phase syndrome (DSPS). Even if you don't have insomnia, getting enough quality sleep after hard training (or really any training) is important for everyone who works out. It's critical to recovery, avoiding overtraining, and maximizing the benefits of the workout. If melatonin can reduce core temperature and pain sensitivity, then supplementing with it could help with symptoms like fatigue when exercising in the heat. To date, though, the performance data for using melatonin pre-exercise just doesn't pan out. Also, you might not want to take it when you'll be in very cold environments because of these hypothermic qualities. In fact, melatonin is particularly active as a critical antioxidant within mitochondria, the energy-producing powerhouses of cells. Supplementing with it could arguably help you recover faster and more fully after tough workouts, and slow the effects of aging, sun exposure, and other stressors that are bad for your cells. For example, a recent study reported that supplementing with melatonin lowered markers of muscle damage and oxidative stress in resistance-trained athletes. Another study found that melatonin supplementation reduced DNA damage and increased antioxidant capacity after high-intensity interval training (HIIT). And, in obese adults, melatonin not only helped lower body weight and improved chemical signals linked with weight control, but also reduced markers of oxidative damage. As the above study in obese adults suggests, melatonin may help with fat and weight loss. Better sleep also means better regulation of hunger hormones (like leptin) and metabolism, which are affected by your circadian rhythm. Plus, if you've ever been up late with insomnia, you know how easy it is to snack all night long. Getting to sleep earlier helps you avoid that trap. Another explanation may be that melatonin reduces the production and release of insulin, as has been reported in a number of studies. This effect by melatonin may also explain why supplementing prior to training increased the use of carbohydrates for fuel during a 30-minute bout of endurance exercise. A "hangover" or drowsy feeling the morning after using melatonin as a sleep aid is also a common but mild side effect. For some, improving insomnia might be worth a little next-day drowsiness. But if these symptoms bother you, stop taking it. Because melatonin seems to lower insulin and can increase blood glucose, those with Type 2 diabetes or prediabetes should consult with their physician before trying it. Also talk to your doctor if you take prescription vasoconstrictors (e.g., if you have peripheral vascular disorder, or PVD), antidepressants, or sleep medication. Are there any dietary forms of melatonin? Trace amounts of melatonin can be found in almost all plants, vegetables, fungi (mushrooms), and algae, but some foods and herbal ingredients contain more than others. Pistachios are the highest reported source of melatonin, providing about 0.25 milligrams per one gram of dried nuts. That means you only need to eat about 25 grams of pistachios to get a potentially effective dose of melatonin. By comparison, walnuts and fresh tomatoes, which are also considered good sources of melatonin, only provide about 0.0000015-0.00002 milligrams of melatonin per one gram; dried lentils provide about 0.001 milligrams per gram. Germinated seeds are also a good source of melatonin, with mustard seeds providing the highest concentration to date—at least four times more than present in sunflower seeds, and more than 10 times that found in flaxseed, but still over 1200 times less than the amount present in pistachios. If you're a coffee fan, roasted and green coffee beans contain between 0.006-0.01 milligrams of melatonin per gram, but the amount present after brewing drops the concentration to at least 100 times less. Caffeine can also cause symptoms like jitters and anxiousness, making it harder to sleep. So don't drink a bunch of coffee hoping to cure your insomnia or other sleep disorders. Salmon and dried egg powder are the highest reported concentrations of melatonin within animal-derived foods, but they're each only a slight bit more abundant in melatonin than walnuts. Cherries can also be a source of melatonin, but what kind of cherries you eat matters. Rainier and tart cherries provide the most melatonin of all of the whole fruits which is still only about 2-4 times the amount present within walnuts. Dried cranberries provide up to 0.096 milligrams of melatonin per gram. Interestingly, black rice and other pigmented varieties contain the highest amounts of melatonin within such grains, and non-glutinous black rice contains almost twice the melatonin as those containing gluten. Similarly, polished grains reportedly contain only about one-third of the total melatonin as those that are unprocessed. Several dried medicinal herbs are quite high in melatonin, with Feverfew (Tanacetum parthenium) leaf, St. John's wort (Hypericum perforatum) flowers, and Chinese skullcap (Scutellaria baicalensis) providing as high as 0.002-0.007 milligrams of melatonin per one gram of dried whole herb. If you don't get enough of these foods and herbs to raise your melatonin levels, consider taking it as a dietary supplement. How much melatonin should you take, and when? Even though bioavailability of over-the-counter melatonin is quite low (10-56 percent), a dose of between 1-5 milligrams, consumed approximately 20 minutes before bedtime, will raise blood levels by 10-100 times the amount you would otherwise achieve while sleeping. The effects will last for about 4-8 hours. Women appear to have greater bioavailability and a faster return to baseline levels than men. Experiment with your dosing of melatonin so that you take enough to get the sleep you want but avoid the hangover effect that can happen when you take too much. Start with 1 milligram of melatonin, then increase your dose by 1 milligram per evening until you find the dose that's best for you. Should you take melatonin with a meal? The jury is still out on whether you should take melatonin on an empty stomach or with food. Since it plays a role in your digestive system, if you take it with a gut bomb-type meal, it might go right to work in your GI tract instead of helping you sleep. The same thing may happen when you consume melatonin on an empty stomach or after long-duration endurance exercise. This means that it's best to take it with a healthy snack like a whey protein shake, a bowl of fresh tart cherries, or a handful of pistachios. What other ingredients should you avoid or stack with melatonin? Caffeine may make melatonin less effective, and alcohol definitely lowers its ability to help you sleep. One study reported that while one alcoholic drink didn't make a difference, two drinks reduced melatonin by 9 percent, three drinks by 15 percent, and four or more drinks by 17 percent. Both zinc and magnesium may increase the natural synthesis of melatonin from serotonin, but no studies have shown that consuming these supplements together with melatonin is any more effective than taking melatonin alone. However, if you don't eat healthfully and you train intensely, then you'll likely need supplemental zinc and magnesium just to keep your testosterone and muscle gains on track. Are there any other names for melatonin? Melatonin is scientifically identified with such catchy names as N-acetyl-5-methoxytryptamine or 5-methoxy-N-acetyltryptamine, or more formally using one of its systematic names like Acetamide, N-(2-(5-methoxy-1H-indol-3-yl)ethyl)- (9Cl). Melatonin is abbreviated as MLT or MT. Slominski, R. M., Reiter, R. J., Schlabritz-Loutsevitch, N., Ostrom, R. S., & Slominski, A. T. (2012). Melatonin membrane receptors in peripheral tissues: distribution and functions. Molecular and Cellular Endocrinology, 351(2), 152-166. Chen, C. Q., Fichna, J., Bashashati, M., Li, Y. Y., & Storr, M. (2011). Distribution, function and physiological role of melatonin in the lower gut. World Journal of Gastroenterology: WJG, 17(34), 3888. Galano, A., Tan, D. X., & Reiter, R. J. (2011). Melatonin as a natural ally against oxidative stress: a physicochemical examination. Journal of Pineal Research, 51(1), 1-16. Mukherjee, D., Roy, S. G., Bandyopadhyay, A., Chattopadhyay, A., Basu, A., Mitra, E., ... & Bandyopadhyay, D. (2010). Melatonin protects against isoproterenol‐induced myocardial injury in the rat: antioxidative mechanisms. Journal of Pineal Research, 48(3), 251-262. Carrillo-Vico, A., Calvo, J. R., Abreu, P., Lardone, P. J., Garcia, S., Reiter, R. J., & Guerrero, J. M. (2004). Evidence of melatonin synthesis by human lymphocytes and its physiological significance: possible role as intracrine, autocrine, and/or paracrine substance. The FASEB Journal, 18(3), 537-539. Atkinson, G., Drust, B., Reilly, T., & Waterhouse, J. (2003). The relevance of melatonin to sports medicine and science. Sports Medicine, 33(11), 809-831. Edwards, B. J., Atkinson, G., Waterhouse, J., Reilly, T., Godfrey, R., & Budgett, R. (2000). Use of melatonin in recovery from jet-lag following an eastward flight across 10 time-zones. Ergonomics, 43(10), 1501-1513. Manfredini, R., Manfredini, F., Fersini, C., & Conconi, F. (1998). Circadian rhythms, athletic performance, and jet lag. British Journal of Sports Medicine, 32(2), 101-106. Auld, F., Maschauer, E. L., Morrison, I., Skene, D. J., & Riha, R. L. (2017). Evidence for the efficacy of melatonin in the treatment of primary adult sleep disorders. Sleep Medicine Reviews, 34, 10-22. Watson, A. M. (2017). Sleep and Athletic Performance. Current Sports Medicine Reports, 16(6), 413-418. Arendt, J., Skene, D. J., Middleton, B., Lockley, S. W., & Deacon, S. (1997). Efficacy of melatonin treatment in jet lag, shift work, and blindness. Journal of Biological Rhythms, 12(6), 604-617. Krauchi, K., Cajochen, C., & Wirz-Justice, A. (1997). A relationship between heat loss and sleepiness: effects of postural change and melatonin administration. Journal of Applied Physiology, 83(1), 134-139. Aoki, K., Stephens, D. P., Zhao, K., Kosiba, W. A., & Johnson, J. M. (2006). Modification of cutaneous vasodilator response to heat stress by daytime exogenous melatonin administration. American Journal of Physiology-Regulatory, Integrative and Comparative Physiology, 291(3), R619-R624. Andersen, L. P. (2016). The analgesic effects of exogenous melatonin in humans. Danish Medical Journal, 63(10). Brandenberger, K. J., Ingalls, C. P., Rupp, J. C., & Doyle, J. A. (2017). Consumption of a 5 mg melatonin supplement does not affect 32.2 kilometer cycling time trial performance. The Journal of Strength & Conditioning Research. Hardeland, R. (2005). Antioxidative protection by melatonin. Endocrine, 27(2), 119-130. Reiter, R. J., Rosales-Corral, S., Tan, D. X., Jou, M. J., Galano, A., & Xu, B. (2017). Melatonin as a mitochondria-targeted antioxidant: one of evolution's best ideas. Cellular and Molecular Life Sciences, 74(21), 3863-3881. Leonardo-Mendonça, R. C., Ocaña-Wilhelmi, J., de Haro, T., de Teresa-Galván, C., Guerra-Hernández, E., Rusanova, I., ... & Acuña-Castroviejo, D. (2017). The benefit of a supplement with the antioxidant melatonin on redox status and muscle damage in resistance-trained athletes. Applied Physiology, Nutrition, and Metabolism, (999), 1-8. Ortiz-Franco, M., Planells, E., Quintero, B., Acuña-Castroviejo, D., Rusanova, I., Escames, G., & Molina-López, J. (2017). Effect of Melatonin Supplementation on Antioxidant Status and DNA Damage in High Intensity Trained Athletes. International Journal of Sports Medicine, 38(14), 1117-1125. Szewczyk-Golec, K., Rajewski, P., Gackowski, M., Mila-Kierzenkowska, C., Wesołowski, R., Sutkowy, P., ... & Woźniak, A. (2017). Melatonin Supplementation Lowers Oxidative Stress and Regulates Adipokines in Obese Patients on a Calorie-Restricted Diet. Oxidative Medicine and Cellular Longevity, 2017. Liu, Z., Gan, L., Zhang, T., Ren, Q., & Sun, C. (2018). Melatonin alleviates adipose inflammation through elevating α‐ketoglutarate and diverting adipose‐derived exosomes to macrophages in mice. Journal of Pineal Research, 64(1). Mulder, H. (2017). Melatonin signalling and type 2 diabetes risk: too little, too much or just right? Diabetologia, 60(5), 826-829. Trionfante, C. P., Davis, G. R., Farney, T. M., Miskowiec, R. W., & Nelson, A. G. (2017). A Pre-Exercise Dose of Melatonin Can Alter Substrate Use During Exercise. International Journal of Exercise Science, 10(7), 1029. Slominski, A. T., Zmijewski, M. A., Semak, I., Kim, T. K., Janjetovic, Z., Slominski, R. M., & Zmijewski, J. W. (2017). Melatonin, mitochondria, and the skin. Cellular and Molecular Life Sciences, 74(21), 3913-3925. Fischer, T. W., Slominski, A., Tobin, D. J., & Paus, R. (2008). Melatonin and the hair follicle. Journal of Pineal Research, 44(1), 1-15. Sagan, D., Stepniak, J., Gesing, A., Lewinski, A., & Karbownik-Lewinska, M. (2017). Melatonin reverses the enhanced oxidative damage to membrane lipids and improves skin biophysical characteristics in former-smokers–A study in postmenopausal women. Annals of Agricultural and Environmental Medicine, 24(4), 659-666. Andersen, L. P. H., Gögenur, I., Rosenberg, J., & Reiter, R. J. (2016). The safety of melatonin in humans. Clinical Drug Investigation, 36(3), 169-175. Atkinson, G., Jones, H., Edwards, B. J., & Waterhouse, J. M. (2005). Effects of daytime ingestion of melatonin on short-term athletic performance. Ergonomics, 48(11-14), 1512-1522. Meng, X., Li, Y., Li, S., Zhou, Y., Gan, R. Y., Xu, D. P., & Li, H. B. (2017). Dietary Sources and Bioactivities of Melatonin. Nutrients, 9(4), 367. Tordjman, S., Chokron, S., Delorme, R., Charrier, A., Bellissant, E., Jaafari, N., & Fougerou, C. (2017). Melatonin: pharmacology, functions and therapeutic benefits. Current Neuropharmacology, 15(3), 434-443.